Ring-ring~ Friday night: A text message pops up on my beat up iphone and to my surprise, its Pikesan from MyRideisMe.com. It turns out that he’s currently in California to cover the Grand National Roadster Show in Pomona for the weekend! He asks if I’m interested in coming down to the show, and without any hesitation I kindly accept the invitation. Honestly, domestic American cars are not really my thing, but I do share an equal amount of respect for automobiles of all kinds so I start packing my gear. I’ve been to many domestic (American) car shows, but nothing to this caliber, some cars weren’t even classics, they were antiques! Lined up in front of me by the hundreds were some of the worlds most beautiful historical customs of all genres. Upon entry, my jaw just drops. Not only were some of the masterpieces displayed worth more than what some people will make in 10 years, but the quality of the work was without a doubt, world class. And, its safe to say that the majority of the cars were born, and bred in the good ol’ US of A. Lots of historical displays accompanied these vehicles from old Coca Cola merchandise to the famous Route 66 themes. In fact, I wouldn’t doubt it if some of these people were still the original owners, or even the car had been passed down in their family for generations. That’s the truest definition of the term priceless in my opinion. As I slowly walked down the isles taking in all that I can, I couldn’t help but over hear some people’s conversations. There was a grandfather telling his grandson, while pointing to a certain Studebaker, telling him that this was his very first car. Other groups of people were greeting each other almost in tears, saying that it’s been 25 years since they all last met… reunited by a single automobile. No reunions for me… I stick out like a sore thumb! Thankfully, a conspicuous small-stature black-haired Asian dude with a big camera is nothing really out of the ordinary, but passed off as a tourist taking photos of America. The rust was awesome! Some cars had so much rust on them that I felt I needed a Tetanus shot before getting close to it. There’s a ridiculously meaningless trend in the import scene these days where people would purposely rust a hood on a Honda Civic. Perhaps they were influenced by these classics, but miserably failed to pull it off. Rat rods = function over form! This particular chopped rat rod had a brass/copper theme combined with the rust. Another Honda fanboy trend that I’ve seen around lately are the painted firewalls. How come it looks so tasteful and original on these hot rods but look absurd on the Japanese cars? It was eye opening to see where those guys get their ideas from. 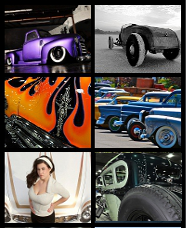 There were a handful of lowriders at the show… all of them superbly exhibiting the very best of their car culture. But what I don’t understand is the chroming of the brake rotors. I mean… this is a dead give-away that the car never gets driven, EVER. This particular lowrider had EVERYTHING chromed (which is normal in the lowrider culture) but c’mon, brakes… really? The Roth Orbitron. There’s supposedly a huge mystery behind this car, how it was lost and found, or replicated… I’m not entirely sure. Regardless, its a huge collector’s piece! More coverage on the Grand National Roadster show on the way at MyRideisMe.com!